Entering Sunday afternoon’s game, the Guelph Storm needed just a single point to ensure home-ice advantage in the first round of the OHL Playoffs against the Owen Sound Attack. The Storm (38-26-2-2) dominated the visiting Sarnia Sting (29-32-4-3) in a 6-2 victory at the Sleeman Centre. Robby Fabbri (three), Jason Dickinson, Pius Suter, and Givani Smith all scored for Guelph. Justin Nichols stopped 17 shots before getting the rest of the afternoon off as he was replaced by Bradley Van Schubert, who made nine saves. Fabbri and Suter both finished the game with three points apiece. For Sarnia, Hayden Hodgson and Davis Brown sored goals while Justin Fazio made 23 saves in the loss. The Sting, after playing last night in Owen Sound, chose to rest a number of players in advance of the playoffs beginning in a game where the outcome had no effect on their seeding for the first round. Guelph didn’t waste any time getting down to business. A mere 32 seconds into the contest, Fabbri opened the scoring. The St. Louis Blues prospect wristed home a shot over the blocker side of Fazio to give the Storm an early 1-0 lead. With an assist on the goal, Tyler Bertuzzi recorded his 100th career OHL assist. With under seven minutes to go in the initial frame, Dickinson extended the lead with an easy tap-in from in close. The Guelph captain positioned himself at the top of Sarnia’s crease, where Noah Carroll found him with a perfect pass. The Sting would claw back to within a goal late in period. Hodgson skated into the Storm zone and fired off a pretty wristshot from the left wing that fooled Nichols over his shoulder. However, just 42 seconds later, Suter netted his 42nd marker of the season and fourth in as many games. The 2015 NHL Draft Prospect snapped a shot from the right circle that found its way to the top of the net by Fazio. The Storm took a 3-1 lead into the first intermission while outshooting the Sting 13-9. With a two-goal lead, the second period saw Guelph’s defence tighten things up, but not before adding another goal. 4:39 into the second while on a five-minute power play as a result of Sarnia’s Franco Sproviero being assessed a match-penalty for slewfooting, Guelph widened the gap. 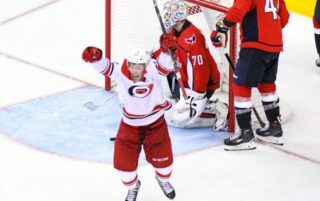 Smith scored his second goal in as many games on an odd goal. After Suter took a shot that hit Fazio, the puck went straight up into the air and fell into the crease, where Smith poked it in. The Storm controlled the Sting for the majority of the period, minus a couple of grade-A scoring chances for the visitors in which Nichols shut down. Coming out for the third period, Guelph’s power play would tally again. 46 seconds into the third, Fabbri registered his second of the afternoon to make it 5-1. On a Guelph power play, Fabbri scored his 50th point of the season when he placed the puck past Fazio after receiving the puck from defenceman Garrett McFadden. Forward Chris Marchese, playing in his last regular season OHL game, recorded the secondary assist on the goal and now has ten points (2+8=10) in his last seven games. With a comfortable four-goal lead, the Storm elected to give Nichols the remainder of the day off heading into playoffs as Van Schubert replaced him. The rookie netminder was tested early before Brown cut Guelph’s lead to three on a shot that Van Schubert would like to have back. The puck deflected off the Barrie, Ontario native’s blocker before trickling behind him. 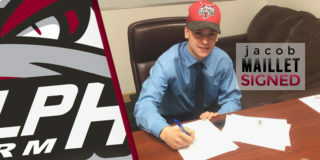 Fabbri secured the hat-trick with 3:24 to go when he sniped a low wristshot to the far side from the left wing, as Guelph defeated Sarnia 6-2 and secured home-ice for the first round of the OHL Playoffs. Final shots in the game were 29-28 for the Storm. With the win, Guelph improves to 22-9-2-1 on home ice while Sarnia drops to 11-20-2-1 on the road. 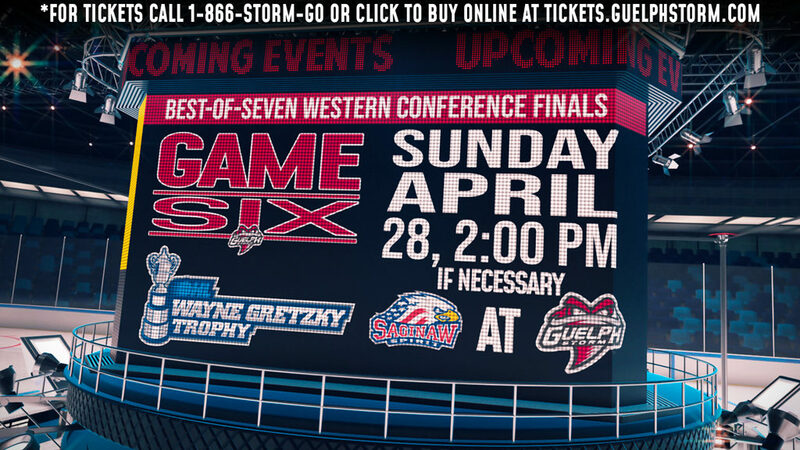 The next time the Storm hit the ice will be for Game 1 of the 2015 OHL Playoffs, Friday, March 27 when they open round one against the Owen Sound Attack. Puck drop is at 7:30 PM. 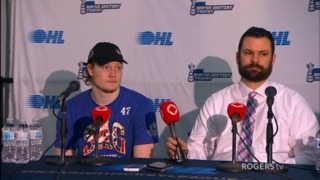 – Chris Marchese played in his final OHL regular season game. The overage Storm player has 10 points (2+8=10) in his last 7 GP. – Tonight’s game was the last of 4 meetings between the teams this season. Each team won 2 games, with the home team winning every meeting this season. 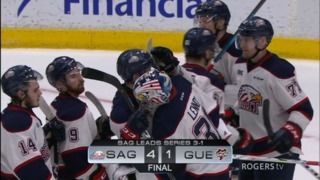 – The Storm clinched 4th place and home-ice for the 1st round of heading into the playoffs. – Guelph has now won 11 of their last 13 home games vs. the Sting. – Storm forward Luke Cairns, who would’ve played in his final OHL regular season game, did not play. – – In the last 4 home games vs. Sarnia, the Storm are 4-0, outscoring them 28-7. 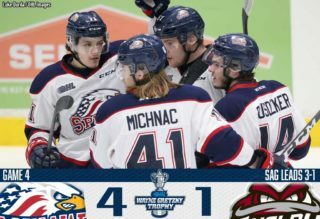 – Sarnia forward and former Storm player Stephen Pierog played in his final OHL regular season game in his hometown and in the same building he won a championship last season. 1st Period-1, Guelph, Fabbri 23 (Bertuzzi), 0:32. 2, Guelph, Dickinson 27 (Carroll, Suter), 13:19. 3, Sarnia, Hodgson 23 (Lajeunesse, Renaud), 17:37. 4, Guelph, Suter 42 (Smith), 18:19. Penalties-Black Sar (holding), 11:15; Rhodes Gue (interference), 14:58. 2nd Period-5, Guelph, Suter 43 (Smith), 4:39 (PP). Penalties-Sproviero Sar (match-slew foot), 3:10; Nikandrov Sar (tripping), 8:06; Lajeunesse Sar (delay of game), 19:39. 3rd Period-6, Guelph, Fabbri 24 (McFadden, Marchese), 0:46 (PP). 7, Sarnia, Brown 20 (Spinozzi), 6:02. 8, Guelph, Fabbri 25 (Bertuzzi), 16:36. Penalties-Hall Gue (high sticking), 7:54; Hodgson Sar (interference), 17:25. Shots on Goal-Sarnia 8-10-10-28. Guelph 13-11-5-29. Power Play Opportunities-Sarnia 0 / 2; Guelph 2 / 6. Goalies-Sarnia, Fazio 8-16-1-1 (29 shots-23 saves). Guelph, Nichols 34-20-2-1 (18 shots-17 saves); Van Schubert 3-5-0-1 (10 shots-9 saves). Referees-Ryan Hutchison (20), Joe Monette (25). Linesmen-Fraser Williams (71), Jean-Francois Menard (52).